Min Ko Naing, a well known 88’ generation student leader and Burmese political prisoners who was imprisoned for more than 17 years for his democratic believes has been suffering from a serious eye infections for the past 3 weeks. Min Ko Naing requested a consultation with an eye specialist but the prison authority refused this request claiming that an eye doctor would not be available before May 2008. Inside prison sources say that his eye condition is seriously deteriorating to the point that he is unable to sleep or eat because of the pain this infection has caused. 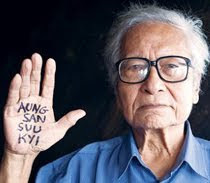 Min Ko Naing has been one of the most prominent and outspoken opponents of the Burmese Military regime. It is very clear that the military regime and prison authorities intentionally refused to provide necessary treatment in order to destroy Min Ko Naing's eye sight. The prison authorities have a long history of using the refusal of medical treatment to political prisoners as a tool for physical and psychological submission. AAPP really concern that Min Ko Naing may loose his eye sight if he does not receive immediate treatment as our political prisoner case files from March 2008 show a similar behavior by the military regime for U Than Lwin, 70, who is in Mandalay prison lost one of his eye sight because he didn't receive in time treatment. When he was sent to eye specialist, the doctors said it was already about two months late to treat his eye and there was nothing they could do to help him. 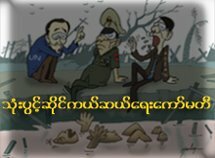 AAPP urgently appeals to the Human Rights Council to discuss with the Burmese Than Shwe's regime the present situation of Min Ko Naing's case.